Steven Gullotta Electro-Industrial After absolutely loving every moment of Kevorkian Death Cycle's comeback album God Am I, you could say that I was quite pleased to see that their new single was available as of today. Though it's been on my radar, I have been a bit busy lately, but thanks to the wonders of late night social media browsing, I was lucky enough to stumble upon a news post about this being out today. And, well, in that case, I'm reviewing this today. Distorted Religion consists of four tracks in total. Of course, you have Distorted Religion as the title track, followed by The Promise (another original), and two remixes from Assemblage 23 and HexRx. With that said, let's jump straight into the music. The title track just began off with a straightforward beat, before heading into a low key beat with an underlying electronic sound that was deep in pitch, but ominous in nature. The chorus was absolutely fantastic, the synths coming out, holding hands, and having a beautiful love session with the guitar work. The vocals remain unchanged, but there is not a problem with that; they serve their purpose better than most other acts out there. Next up came The Promise, which began with what sounded to me like a demon rattling off some lyrics that weren't walking all too much in the light. And, the synth work, sounding like organs during the chorus was astounding once more. Say what you will about KDC, but they know how to slam home hard when it comes to their chorus sections. Absolutely grand in scale. The remix of the single by Assemblage 23 began off with a line that sounds like it was spoken by a Westboro Baptist Church member, speaking of God hating fags. Anyway, the guitars are gone in this remix, with electronics absolutely dominating the whole track. Lovely work, and the samples inputted gave the song unique flavor. HexRx came along to remix The Promise, creating an electronically harsher track in comparison. Thankfully, they didn't do away with the organ work that I fell in love with, and used it strategically in random spots of the song to their advantage. Again, wonderful work done by these gents. 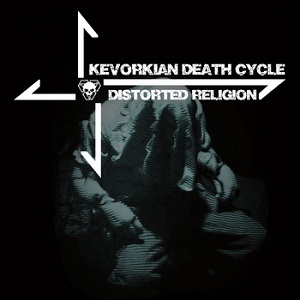 After absolutely loving every moment of Kevorkian Death Cycle's comeback album God Am I, you could say that I was quite pleased to see that their new single was available as of today. Though it's been on my radar, I have been a bit busy lately, but thanks to the wonders of late night social media browsing, I was lucky enough to stumble upon a news post about this being out today. And, well, in that case, I'm reviewing this today. And, well, holy Hell, if this is teasing the new album, I am absolutely excited for it. These four tracks put a bunch of my faith that their next release can match - or even surpass - the wonders that were held in God Am I. The single itself is available via the Negative Gain Productions Bandcamp for three dollars. And, for four outstanding songs, you really can't go wrong with that deal. Spread the word; these guys came back from a long hiatus with God Am I, and nothing's stopping them from marching forth out of a long sleep. And this single is pure testimony to those words.